Airy, filled with a Danish spice swirl, and chock full of buttery streusel. Serve warm, make everlasting food memories. Working in the business of food, I'm often asked, "What's your favorite thing to cook?" While the question is well-intentioned, it just plain misses the point. People who work in food are intense, passionate, and not about to have a pat answer to what is, to them, a superficial and ultimately irrelevant question. A better question is, what motivates you to build your career around food? I have a lot of answers to that one. Food, to me, is a form of communication, intimacy, caring, surprise, delight, nurturing, creativity, and adventure. Among other things. My philosophy and goals around cooking basically come down to this: any person I would want to hang around with has at least 3 meals in their life that they have never gotten over. Those meals are as vivid in their memory now as they were when they were first experienced. They can still taste, smell, bring up every aspect of what that food was like for them. Where they were, whom they were with, the taste of what they ate are still powerfully immediate for them. My goal is to be the person who makes them one of those meals. Many people have taste memories tied to family, often to a parent or grandparent who first started teaching them to cook. Others have beloved taste memories from childhood grocery store foods that have either disappeared or been altered out of all recognition over time. Be still, my heart. And NO ONE would put these on cloth; too much melted glaze would be lost!! For me, some of those treasures were Morton’s Honey Buns (a frequent dessert, heated in the toaster oven, me burning my finger as I swiped up the melted sugar glaze), Taylor Pork Roll in any breakfast iteration (see this post from Serious Eats to get a taste), and Sarah Lee’s Butter Streusel Coffee Cake. Do you remember the red box? Behind the door in the freezer aisle, a certain section held the promise of warm, fragrant, buttery nirvana. A round, crimped foil pan with the red cardboard top sported a photograph of a coffee cake, sliced, crumbs on top, a swirl of cinnamon inside. Once in a great while one of these came home to be warmed in the oven and brought to the Sunday breakfast table. Butter Streusel Coffee Cake was unbelievably tender, with an unforgettable, slightly tangy note balanced by the sweet, spiced filling. The hefty coating of mostly buttery-with-a-hint-of-more-cinnamon crumbs was half crunchy, half soft. I remember so much butter was involved that my fingers would be shiny after picking up a slice. It never occurred to me that I could replicate such perfection, but in the course of recent events I made a sweet dough that had cream cheese in it, and it hit me that the texture and flavor was close— very close. I won’t tell you how much time I spent staring at the photo of the slice on the current box, trying to reconcile what I was seeing with the shape I remembered. The coffee cake of memory had swirls and twists to the dough with the cinnamon inside, buttery crumbs falling all around. Then I stumbled across an old product description referencing a sweet Danish dough, and things all fell into place. I went back to my pastry training and looked up the spice mixture for Danish, and mixed them into a filling with brown sugar and cinnamon. With that hurdle cleared and a little shaping experimentation, and I was there, back in Sunday morning breakfast heaven. And now you can be, too. By substituting cream cheese for some of the butter, this coffee cake has that familiar tang and amazingly light texture, without leaving an oily sheen on your fingers. For the dough: Combine all of the dough ingredients in the order listed in a large mixing bowl (use the paddle attachment on a stand mixer) or the pan of a bread machine set on the Dough cycle. Mix until a smooth, soft dough comes together. Knead until the dough is smooth and shiny. It will be soft but shouldn’t stick to your finger when lightly touched. Cover and let rise until puffy-looking (it won’t quite double), about 1 hour. For the filling: Mix all of the ingredients except the milk together until evenly blended; set aside. For the streusel: Whisk together the flour, sugars, salt, and cinnamon until blended. Pour in the butter, all at once, and stir until the dry ingredients are evenly moistened. The mixture may solidify some; that’s ok.
To assemble: Preheat the oven to 350°F. Grease two 9” round pans. After the first rise, turn the dough out onto a floured work surface and press out into a rectangle 12” wide by 14” tall. 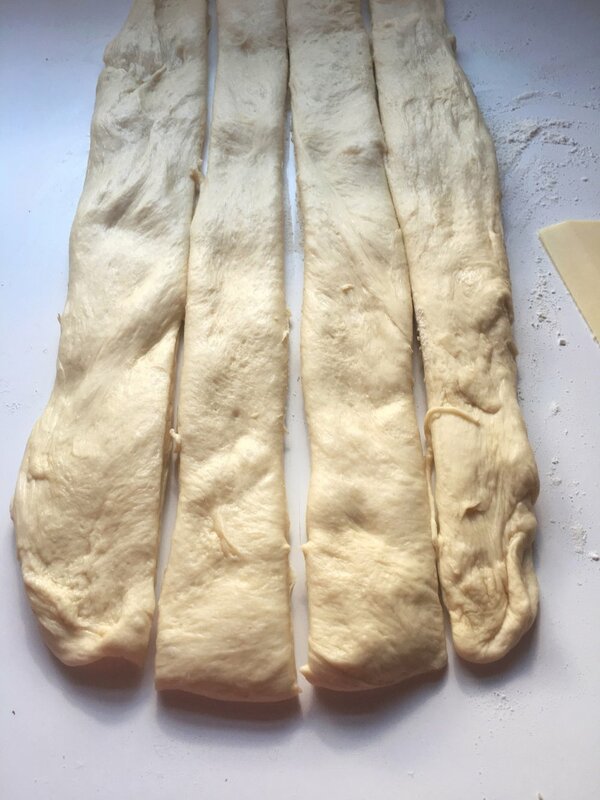 Cut the dough into 4 lengthwise strips. Brush a strip with the milk and pour a 1” stripe of the filling mixture down the center. Pinch the dough closed over the filling. Repeat with the remaining strips of dough. Twist the dough and place one end in the center of one of the prepared pans. Wind the dough around in a spiral, leaving ½” of space between the coils for the dough to expand into (and to capture chunks of the streusel you’ll be sprinkling on top). Use two strips of dough per pan. Repeat the process to fill the second pan, then crumble the streusel over, dividing it evenly between the pans, using all of it. Let the coffee cakes rise for 30 minutes, then bake for 28 to 32 minutes, until deep golden brown and cooked through in the center. Remove from the oven and cool for 10 minutes before ripping in to it, if you can hold off for that long!